Pre owned laser tubes are refilled, tested and shipped with 'certificate of performance'. We refill Deka tubes to factory specifications with one year power warranty. We also have refilled Deka SmartXide DOT tubes on consignment for sale. Inquire for availabilty at sales . fresh refill with one year warranty, $4,495. fresh gas refill and 1 year power warranty, $4,995. Best buy. Sharplan 1020 Medical co2 laser tube. Best buy. 15 Watt glass laser tubes, complete with optics, $350 while they last..
PHOTO These are complete laser tubes but empty, without laser gas, ready for your own refill and experimetation. 36 mm (1.4") diameter by 46 cm (18") long. They are 'Made in Israel' for a medical company. We have a few of them for sale at $450 each. The II-VI output coupler and total reflector mirrors alone are worth more than that. We charge $650 to refill. Sharplan F-125 Handpiece. Complete with lens and 90 degree mirror. Good value. PLC Medical = former Laser Engineering Inc. This is a 30 Watt sealed co2 laser tube made by LEI. 34 inches long x 56 mm dia. Will refill with fresh gas before shipment. Excellent price. (2) Model SLC100N and Surgilase C9 tubes, fully refurbished.. These are all 100 Watt sealed co2 laser tubes for $3,800 each. SOLD. (Spectron Laser Corporation (SLC) purchased Surgilase and renamed the tube from C9 to SLC100. Spectron was then sold to GLS Lumonics and after a few years they became Novanta Inc and stopped manufacture of all glass co2 tubes). Needs gas refill, otherwise in good condition. $3,000 SOLD. Full documentation for the above 5000C. Over 1,000 pages! PHOTO . Electronic circuit diagrams, controllers, computer pattern generator and much more. 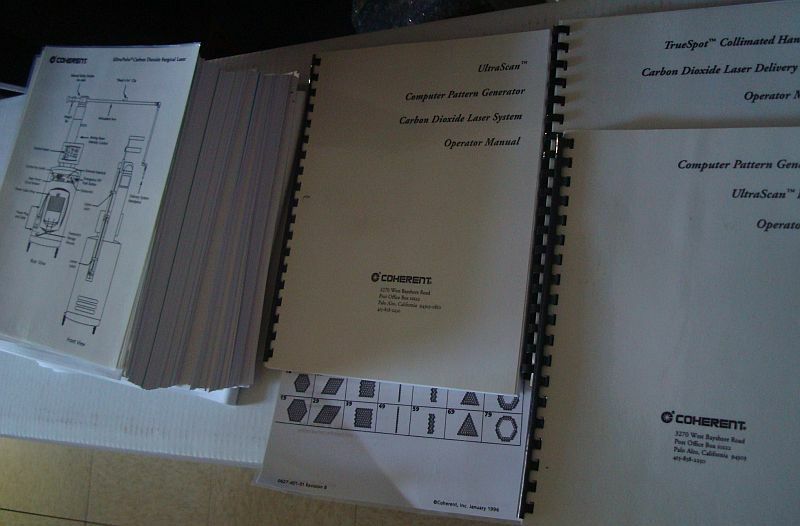 You could reverse engineer this surgical laser for the price of these manuals. $300 SOLD. What is wrong with it ? The system tipped over. Two wheels under it broke off. Insurance company has paid for it (less deductibles) and it is now available for a Biotech to fix it or take it apart for parts. - As is : $350, complete laser tube with front and rear optics, needs gas refill. - Additional cost to refill : $950. Run them with matched Chinese power supply, $500. This tube is 56 mm in diameter and one meter long and it is water cooled. Both ends are open. You can install your own optics and then fill it with co2 laser mix. The beam size and divergence are determined by the optics that you use. It is sold by its manufacturer as a 30 Watt laser tube and they recommend 20 mA at 8 kV (Not filled, not sealed. It is open so YOU can fill it with various gas mixtures and experiment with it). New -30 watt Chinese made co2 laser tube with optics and electrodes, (Not filled, not sealed. It is open so YOU can fill it with various gas mixtures and experiment ) $190 SOLD Photo This is identical to the above except it has optics and electrodes. - Our own New 30 Watts tubes, glass-to-metal seal, perfect TEMoo mode will focus down to 0.001". 3 year warranty on output power. $1,500. Sevev (7) available at this price. These are OEM medical laser tubes that did not fit for physical size being 1/2 inch too long to fit in medical machine. OEM customer runs them with matched Chinese made power supply. Laser tube plus power supply $2,000.